Unsure what music you should be listening to to see in the New Year? 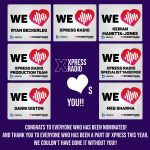 Here at Xpress Radio, we’ve got you covered! We’ve put together a “banging” mini mix featuring the best New Year’s Eve anthems.